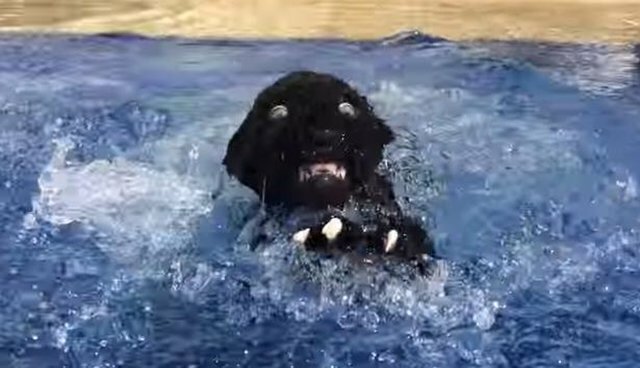 Black jaguars are known to be quite capable swimmers - but even they have to start somewhere. Here's an adventurous cub named Cielo who seems to have somewhat overestimated her inborn aquatic abilities. While hanging out poolside with her caretakers from the Black Jaguar White Tiger Foundation, Cielo summoned the blind confidence to take a big bold leap into the water - only to discover that staying afloat isn't as easy as it looks. But hey, who hasn't been there? The original people who 'cared' for her at birth planned to sell her to a pet shop owner whose mission was to drug her to take photos with the public for profit. We were so lucky to have intercepted her from a life (if one could call it that) in confinement. She was our first baby and the cornerstone of the Black Jaguar-White Tiger Foundation. Cielo is a force of nature to be dealt with and she loves to exhibit her power, beauty, and grace whenever possible. Thankfully, Cielo has since grown up to be as beautiful as an adult than she was cute as a cub. To learn more about Cielo and the the Black Jaguar White Tiger Foundation, visit the group's website here.